Our main karate school classes run Mondays to Thursdays, and we have a New Starters intake after every school half term. We run children's classes for ages 5 to around 7 (Little Dragons) and 7+ (Karate Kids). We also run a fabulous Saturday Morning class for Pre-Schoolers; check out the Panda Tots tab for more information and to book. 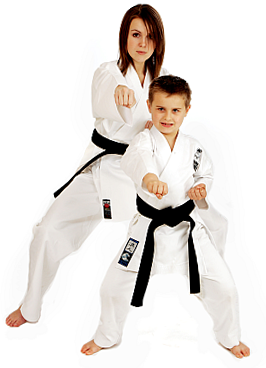 Our aim is to build a child's confidence and self-esteem through achievement in Wado-Ryu karate and other self-defence techniques, in a fun and friendly atmosphere. We do this using by practising karate & self-defence activities, mixing in games that develop co-ordination, balance and quick reactions. We also expand on the 'self-protection' aspect of karate by working with students on life skills; such as knowing your parent's phone number for the little ones, through to anti-bullying strategies for the older children. Although the majority of our students are children, we also have a flourishing Adults class (for adults of all ages! ), starting at 15yrs, with no upper age limit. button, (or below if you're using our mobile site) for further information on class content and times etc.